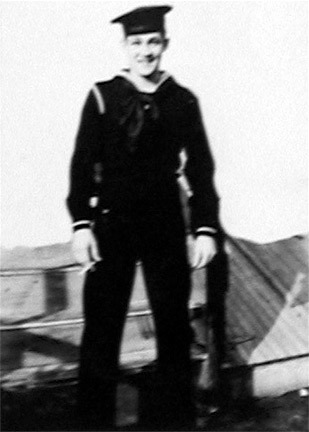 SEAMAN FIRST CLASS WILLIAM GEORGE MacELDOWNEY JR. grew up in Woodlynne NJ, where he lived at 252 Cedar Avenue. A student at Collingswood (NJ) High School, he was due to graduate in 1940, but left school. He worked at the RCA-Victor factory in Camden NJ, and was a member of the United States Naval Reserves. William MacEldowney Jr. was called to active duty on January 1, 1941. 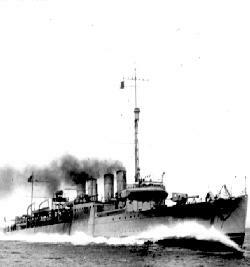 He was assigned to the USS Barry DD248, a WWI vintage "four-stacker" destroyer. The Barry was engaged in training and patrolling the Caribbean in early 1941. 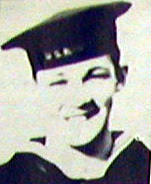 On his brief time aboard the Barry, Seaman MacEldowney was in Balboa, Panama and on the island of Trinidad, among other places in the Caribbean. On April 8, 1941 he was stricken with appendicitis. The Barry put in at St. Lucia on April 11, and he was removed to Castries Hospital. An operation was performed that same evening. however William MacEldowney died of peritonitis from his burst appendix on April 15, 1941, at the age of 20.